My mom stole this recipe from a magazine in a doctor’s office for me. I feel bad for the other patients in the waiting room now who will see the brownie article referenced in the index, turn the pages to look for it and silently curse when they discover that my mom has ripped the page out of it’s binding cause she knows her daughter, who is a chocoholic, will make these brownies and post them on her blog. Thanks Mom. Apparently my mom has done this before because she managed to make sure she ripped out the header and footer of the page so I know what magazine she defaced. It was Saveur and this is what it says at the top of the brownie article. "A version of this recipe accompanied an interview with the actress Katharine Hepburn in the August 1975 issue of Ladies Home Journal. 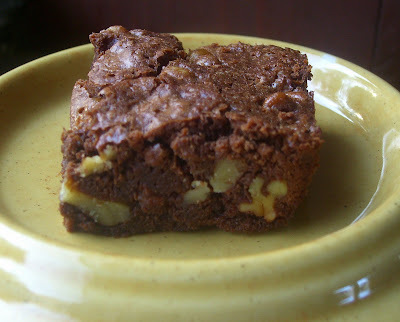 This brownie recipe produces incredibly chewy bars with a full but mellow chocolate flavor". I made this for a Labor Day party that I am having today, just as a little something extra (these aren't brownies to feed a crowd unless you make two batches). These weren't what I expected. I tasted a tiny corner as they crumbled coming out of the pan, and they were good, but I think 1 cup of walnuts is too much for this size pan. 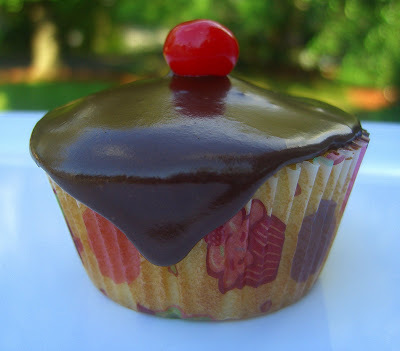 I'd cut it to 1/2 a cup if I made these again. They were a crumbly mess to get out of the pan, even with the parchment on the bottom. The top cracked pretty badly too. Not a good looking brownie at all, but they do taste good and I'm certain they will be gobbled up at the party, crackly top and all. 8 tablespoons unsalted butter, plus more for greasing. Heat oven to 325. Grease an 8x8 baking pan with butter then line with parchment paper, greasing the paper also. Melt the butter and the chocolate in a 2 quart sauce pan on low heat, stirring constantly with a wooden spoon over low heat. Remove from heat and stir in the sugar. Add the eggs and vanilla and stir to make a smooth batter. Add walnuts, flour and salt; stir until incorporated. Pour the batter into the pan and spread evenly. Bake 40-45 minutes until a toothpick inserted into the center comes out clean. Cool on a rack. 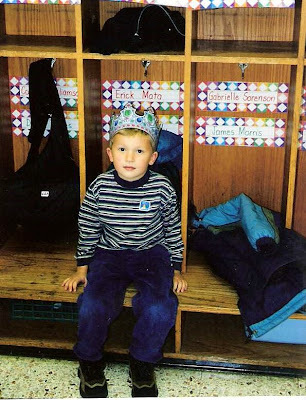 This is the first year that I haven’t taken the first day of school off since the boys started kindergarten. It feels so strange. There are certain days throughout the year that I have just always made sure that I wasn’t working. The first day of school was always one of them. I walked down to the bus stop with them; I waited by the curb for their bus in the afternoon. I made sure there were always warm cookies waiting for them. I couldn’t wait to hear about their teachers and classmates. This year they will both attend Junior High. No more kids in middle school *sniff*. No more being a teacher’s helper in the classroom. They will both be out the door and on the bus before I even leave for work. I was informed that I didn’t need to accompany them to the bus stop. “Please Mom – Don’t”. Ok, ok I get the hint. Halloween is another day that I always take off. I make a spooky supper, and special treats and then we all go treat-or-treating. This year I’m not so sure my 13 yr old will want us to accompany him. This makes me sad. My boys are growing up. Needing me less and less and it truly aches my heart. 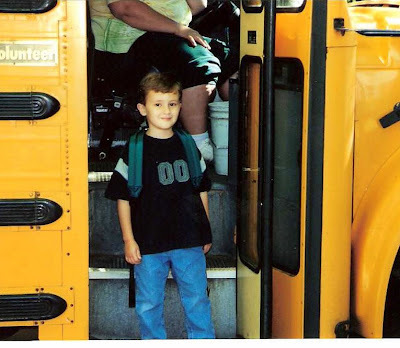 Evan 1st Day of Kindergarten. My babies are growing up too fast. I happy to say that I still get goodnight kisses, and hugs and I still get “I love you’s” before they head off to bed. When I read the title of this recipe I just knew I had to make them. 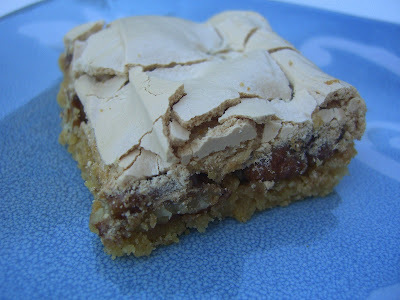 Butterscotch Bars with Brown Sugar Meringue Topping. Reading that made my mouth water. I found a copy of this recipe in another cookbook I checked out of the library. It sounded better than all the recipes in the book I had so I decided to try it. 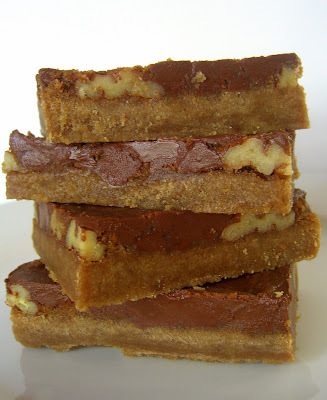 The copy said the recipe was from the 1930’s and this butterscotch bar was very popular with midwestern ladies at their bridge clubs during the 30’s and 40’s. Set oven rack to middle position and preheat to 350. Line the bottom and sides of a 9x13 in pan with foil, shiny side up and coat with vegetable spray. Line a baking sheet with foil. Place pecan pieces on baking sheet and toast 7 – 10 minutes, stirring a few times for even browning. Be careful not to burn. Cool to room temperature. Combine the flour, baking powder, salt & brown sugar in the bowl of a food processor fitted with a metal blade. Add the butter and process until the butter is the size of small peas. Add the egg yolk and vanilla and pulse three or four times until the mixture as the consistency of sandy clumps (up that’s what the recipe said – sandy clumps?!) Pat mixture into the pan and level off by pressing with a small offset spatula. I used the back of a flat measuring cup for this. Press pecans into the mixture. 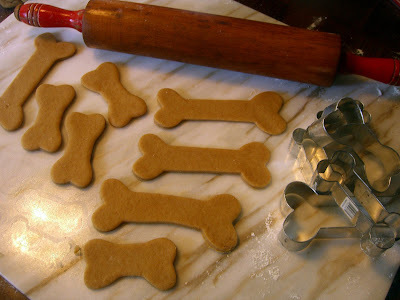 Make sure you press them in fairly well so they will stay in place when you spread the topping on. To make the topping place the egg white in the bowl of a stand mixer fitted with a whisk attachment. Beat until the whites hold a peak when whisk is lifted. Add the brown sugar and beat at the highest speed about 4 minutes. Spread the meringue over the pecan layer and bake 25 minutes or until tester inserted into pan comes out clean. The meringue will crack slightly. Let cool on rack completely then cut into squares. Store between sheet of wax paper in a covered tin. These were good, but they really didn't have that butterscotch taste that I was looking for. 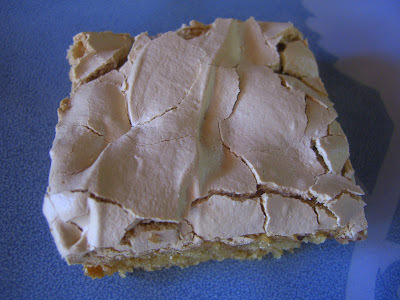 They are good, but I'm not tasting the title.The meringue topping really gives these a nice crunchy, crackly topping. 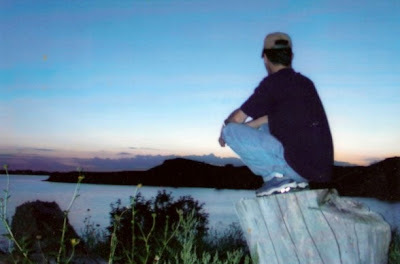 Everything in my little world is coming back to me. The planets are re-aligning, the stars are shining a little brighter, and all is well in my little kingdom. I am in countdown mode. Part of it is counting down the days to 3 shows that I got absolutely addicted to last season. Big Love – Season 3 – 2009! Out of all three shows I am tragically and hopelessly in love with Dexter. 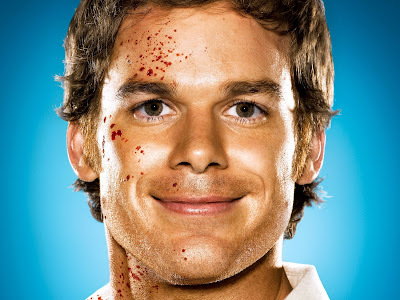 The forensic serial killer has captured my heart and I often found myself saying, “He’s the kind of guy I could love even if I knew he was serial killer.” I’m so angry that I have had to endure all these months without my Dexter fix. I was a latecomer to two of these shows. I didn’t start watching Heroes until the second season. John had watched it from the beginning (and I admit, I called him a nerdboy when he starting watching it) but when I went and got hooked on season two we bought season one so I could catch up. We had marathon “Hero Nights” where we would try and cram in as many episodes as we could before I fell asleep on the couch. Dexter was the same way. Watched a second season show and then had to go “on demand” to see all of season one. Big Love I caught from the beginning. When will HBO start showing new episodes of Big Love? 2009?? Yup you read that right. I've been waiting since 2007! Come on! I’m gonna need an hour recap before I start watching again. The biggest and most important countdown has been to Mitch’s homecoming. Let me rewind for those of you who don’t know the story. Mitch is one of our very best friends. He is family to us. He stupidly decided to move to Missouri in May of 2007. My heart was broken. The whole family actually went through a mourning period without him in our lives. I can’t even think about the day he left us without crying. Fast forward a few months, Mitch gets into a horrible accident, ends up broken, battered and in a coma for a month. We are frantic here with no way to reach him, and are constantly calling all his family members for updates. I wrote him letters, lots of letters. I chronicled life that was happening while he was sleeping. After a month he comes out of the coma and is practically good as new. Well there was lots of therapy, but still, almost good as new. We still miss him, and even keep his chair at the kitchen table in anticipation that he will smarten up and move back to RI. Mitch moves from Missouri to Kansas to recover and once again our hopes of having him come home to us seem less and less likely. It was a long summer without my garden helper. He called every Sunday faithfully. He’d update us on life in Kansas. He would comment on the food on the blog. He tells me he misses me terribly but he misses my cooking even more! Huh?! In July we get the fantastic news that yes, he has come to his senses and will be moving back to RI. So in a very short time, he will be on the road and heading back home to us. I can’t even begin to tell you how happy that makes me. Once he’s back the celebrations will begin. I plan on cooking up all his favorite foods. Our empty chair at the table will be filled and once again our family will be complete. Yesterday was one of those very long and hectic days for me. When I got home I proceeded to fall into my same routine. Those of us with a touch of OCD like routines. I did what I always do when I come in from work. I immediately throw my shoes off and change into a t-shirt & shorts. The shorts that I like to wear with this particular shirt were in a basket in the laundry room (i.e. the garage). While I was on my way to the laundry room I was sidetracked by 5 different things, then I started in on supper, had a small kitchen disaster, cleaned that up, ate dinner and sat down with the boys to go over their summer reading programs cause school starts in a week. Evan realized that he needed one more book to read and he wasn’t happy with any of the books he had at home. “Ok let’s run to the library then”. He ran outside to kick the soccer bowl around until I came out. I walked past my husband, grabbed my purse and a book bag, walked out of the house, got in the car, started the car, called for Evan to get in, backed down the driveway and as I went to buckle my seat belt I noticed something. I didn’t have shorts on. I walked out of the house in my underwear….past my husband and Jesse, out into the yard on my deck and right past Evan. You think one of them would have looked up and noticed that I didn’t have shorts on??? Nope. So now I am in the car, hysterically laughing to the point I might wet myself and I realize I have to get out of the car, in my underwear, and run to get back into the house. 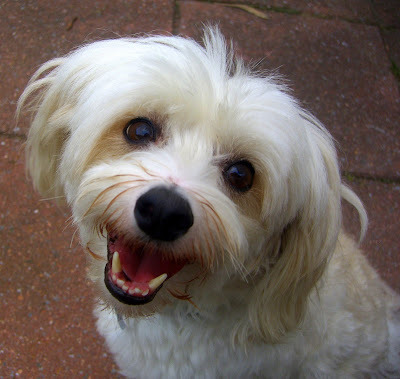 I made a mad dash for the back door and stood in the breezeway, leg crossed; laughing so hard I could hardly speak. John came to see what the noise was all about and it was all I could do just to point to my purple undies and mutter “I just left the house in my underwear”. Then he starts laughing. Tears were now streaming down my face. Evan gets out of the car and comes in now, shaking his head at me. It’s true. I’d live in just a t-shirt if I could. I sleep in t-shirts. I’m comfy in t-shirts. Pants and shorts make me feel restricted, and I do roam the house half naked most times. Growing up as the only girl in my house, and not being very prudish, my mom always said that I had no shame. She’s partly right. In my house I am perfectly comfortable being half clothed….but at the library??? Come on! I do have an increment of shame after all. It's been awhile since I made cupcakes. It's a pity really. Cupcakes are one of my most favorite things on earth. I love them so much that I am even contemplating getting a cupcake tattoo. No joke. 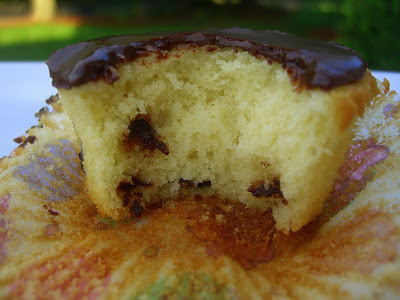 I want this most favorite of all confections tattooed upon my body so I can have a little cupcake with me all the time. I've been thinking about it for quite a long time now. It's been about 6 years since I got my first tattoo (sun/moon on my ankle) and it's true what they say....they are addicting. As soon as I got my first one, I started thinking about the next one. I am still tempted and haven't given up on the thought that I need to get my Aerosmith "wings". For those non Aerosmith fanatics out there, you get your wings when you have the Aerosmith logo tattooed on yourself. That may be tattoo #3. My Mom reads this blog, so I'm sure she just sighed when she read that part. Move along Mom. I do want a perfect little cupcake somewhere on my body. I haven't decided where yet, or what it will look like, or what color the frosting will be (I am leaning towards pink) but it will be adorable and have sprinkles, that I know for sure. For now I have to stick with the real thing. In a bowl whisk together flour, baking powder and salt. In another bowl mix sugar and butter with an electric mixer until well combined. Beat in eggs one at a time. Mix well after each addition. Add vanilla. Alternately add in the flour and milk. Beat until smooth and stir in chocolate chips. Fill lined muffin cups 2/3 full. 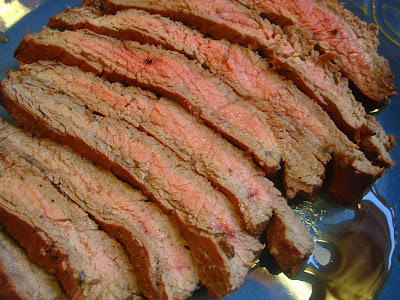 Bake 18 – 20 minutes, or until golden brown and top springs back when touched. Let cool in pan 10 minutes then transfer to wire rack. Cool completely before frosting. 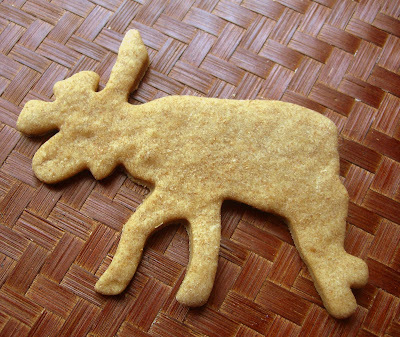 What I love about this icing is you don't need to break out a beater or mixer to make it. Just whisk! This is my entry for the Potato Ho-Down. 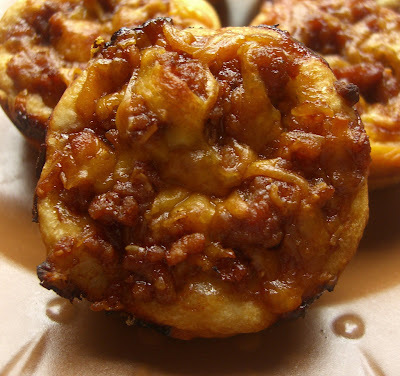 If you want to check out some yummy potato recipes check out Evil Chef Mom's blog in the next few days. It will fulfill all your spudtastic fantasies. 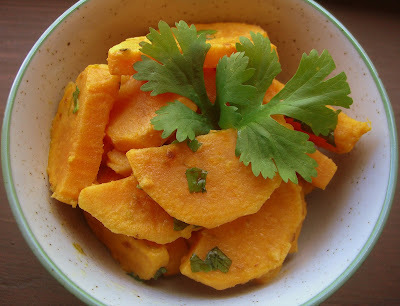 I know....garlic and lime with sweet potatoes?? Sounds kinda interesting huh? I was hesitant to make this recipe because I knew I would be the only one in the house to eat it. No one likes sweet potatoes but me. It's right up there with eggplant in terms of yuckiness for the rest of my family. My mom and I usually split some kind of a sweet potato dish on Thanksgiving. She shares my love of the orange spud. I will share this her. 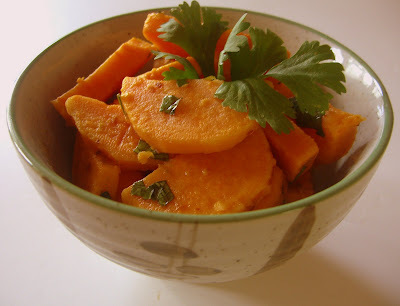 In a saucepan over high heat brings the sweet potatoes and enough salted water to cover them to a boil. Cook 10 minutes, or until fork tender. Drain and transfer to bowl. In a skillet over medium heat cook the garlic in the olive oil for 2 minutes. 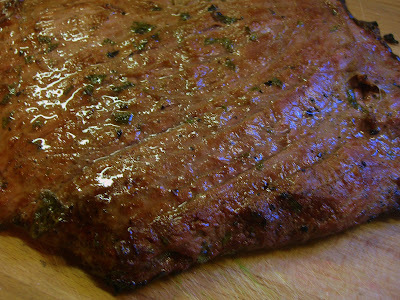 Remove from heat and stir in 2 tablespoons lime juice and 1 tablespoon of lime zest and 1 tablespoon of cilantro. Add salt and pepper if you’d like. Pour garlic mixture over the cooked potatoes and toss until coated. The lime and cilantro give the potatoes a nice zing. You can eat his dish hot or cold. I prefer to chill it and eat it like a cold sweet potato salad. I know I haven't posted in a while. It's been kind of a lazy week. Evan and I decided to re-read The Miraculous Journey of Edward Tulane. Moms if you don't have this book, go buy it. You will not be disappointed. I cry every time I read it. We spent almost every night on the couch, legged crossed over each other, reading. A few nights we had some heavy downpours which made our nights on the couch even more enjoyable. Jesse even popped in and listened a few times, although he would never admit it. Summer vacation is winding down and I'm longing to spend more time with the boys before the hectic return to school begins and my nights are full of lunch packing, and homework checking. Evan started soccer this week so his schedule will have us at soccer fields most Saturday mornings. I'm already thinking up snacks for the team. I can't wait. This recipe is from my personal fishmonger. He’s not technically a fishmonger but he’s a guy I’ve been working with for the past 25 years who has a big boat and catches lots of fish and has graciously shared with me for many years. He lovingly calls me his Chia-Pet. We often swap recipes, not fish related even. He shared this one with me a while back and kept insisting I make it. He kept telling me I wouldn’t believe how it makes a crust out of nothing. I wanted to wait until the garden tomatoes were ready. This week I picked a bowlful of cherry tomatoes and let them get good and red on the window sill. Although I don't like raw tomatoes, yes I know a Sicilian who doesn't like tomatoes, I do like them baked. Preheat the oven to 350. You don’t need to spray it. I know you might think its nuts to not spray the plate you are making a quiche in, but trust me, don’t spray it. 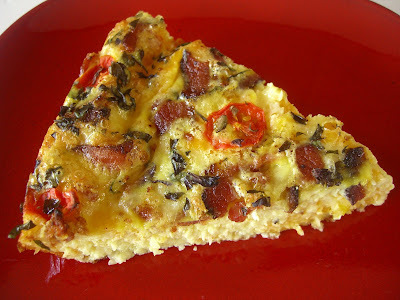 Place cheddar and flour in pie plate and mix lightly with you fingers. Add the Monterey Jack & Swiss and gently mix with your fingers again. Beat the eggs with the ½ and ½ until frothy. Pour over top. 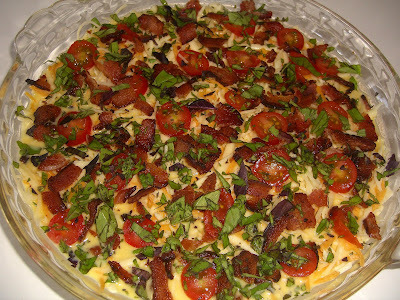 Place the tomato & bacon on top of the mixture and then sprinkle with fresh basil. Bake for 40 minutes or until top is golden brown. I used a combination some Red Rubin & Italian basil in this. I should have listened and made his recipe much sooner. I had a piece for lunch, and it was delicious. It's a holiday in Rhode Island today. Victory Day. We are the only state that still celebrates it. There are a lot of Rhode Islanders working today, John and I are not. It's catch up day for us. There is laundry that needs to be done from John's trip, some cleaning and re-organizing is happening and my never ending quest to keep my fridge spotless (it's an illness I tell you) is underway. I'm also making a big chicken soup today. It's rainy and damp out, so outdoor activities are not happening. I have so much stuff to do in the yard too. Oh well, another day. While the chicken soup is in the making I popped some BBQ Cups in the oven to hold everyone over till dinner time. This is an appetizer that is usually served at our Super Bowl party. Every time I have made these little BBQ cups they are the first things to go. They are so easy to make it’s almost embarrassing. I usually double this recipe, because one batch is never enough for a crowd. I didn't double it today since it was just the 4 of us. *Half hour after they were out of the oven and there are 3 left. I think I pulled this recipe out of a magazine waiting at a doctor or dentists office. I vaguely remember the little piece of paper I ripped out of the magazine. Since then I have changed a few things and made it my own. What's new with that huh? This recipe is ridiculously simple too. In a saute pan cook the onion until they are translucent. Add the meat and cook until done. Drain and place into a good size bowl. I almost always use ground turkey and no one is the wiser. You can use ground beef, heck I think leftover pulled pork and brisket would work too. I add the BBQ sauce to taste. Just squeeze a bunch in the bowl until it looks right to you. You want it to coat all the meat, but not make be soupy. Add, taste and re-evaluate until you get it the way you like. Our favorite BBQ sauce is Sweet Baby Ray’s Honey BBQ. After the meat has cooled a bit, grab a handful of the shredded cheddar and mix it into the meat. Put as much as you like. I would guesstimate about a good full cup, at least, lol. Grab a muffin pan or two and break open your biscuits. 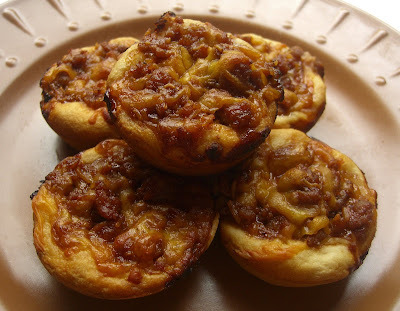 Take one biscuit in your hand and pull it like a mini pizza. You want to stretch it out so you can get it into the muffin pan, and pull it up the sides a bit. Don't worry if they kinda shrink back down into the pan. I make 3 at a time. I work on one row of the muffin pan so that the dough won't shrink back too much. So stretch 3 out and then fill those 3. I use a good heaping tablespoon of the meat mixture. The dough is going to rise up and make a little cup around the mixture so don't worry if they don't look right when they go in the oven. Sprinkle a little cheese on the top of each on before they go in the oven. Bake at 350 for 15 - 20 minutes. Just until they are lightly golden and the tops are bubbly. Don't over cook or you will burn your buns! I run my frosting spatula around the edges to pop them out. This recipe will make 24 cups. You will have a few biscuits leftover. We like to coat them in cinnamon & sugar and bake them off for breakfast. Cheesy and barbequey with a biscuit on the bottom. These are some good eats. *These are sold in 4 packs at my grocery store. Evan and I have a love affair with crackers. 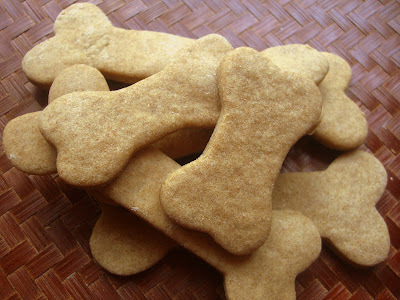 I like to think that it stems from my great grandfather Berties love of the crunchy treat. I remember many a lazy day spent at his house eating graham crackers covered in butter, or oyster crackers eaten straight out of the box. Our snack cupboard is filled to the top with all sorts of different crackers. 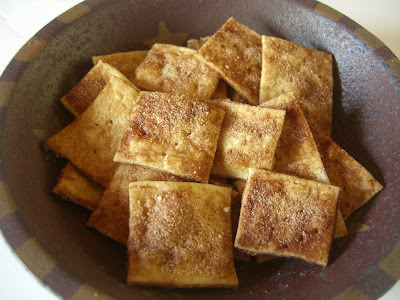 By far, our favorite of all the crackers in this vast cracker kingdom we call home, is cinnamon sugar crackers. When we are desperate for a sweet treat we have been know to take a plain graham cracker and cover it with butter then sprinkle it with cinnamon & sugar. We’ve even done it with plain tortillas. I believe the year that Evan started kindergarten he ate cinnamon sugar toast almost every single morning. “Extra cinnamon-sugar please” was the most he said some mornings. Very quiet child. 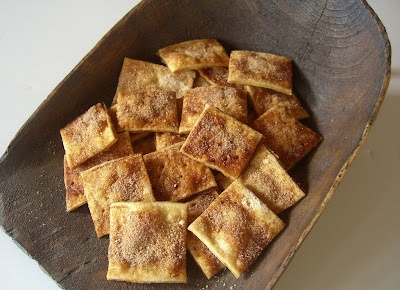 I was so happy to see a recipe for Cinnamon & Sugar Crackers on Heaven is Chocolate, Cheese and Carbs. Preheat oven to 400 F. Mix dry ingredients together in a medium bowl being sure to get everything well blended. Add the oil and half of the water and begin mixing. Add more water as necessary to form a rough dry dough. Turn dough out onto a lightly floured surface and knead just until it comes together into a cohesive ball. Divide dough into even quarters. On a piece of parchment paper, roll dough as thin as possible. 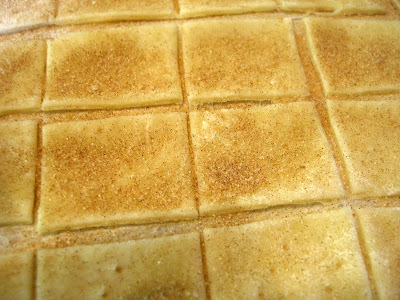 Cut the dough into squares or other desired shape and use a fork to prick each square. Sprinkle generously with cinnamon/sugar mix. Bake for 15 minutes, or until golden brown, turning the sheet once half way through. While the first batch is baking, roll out another quarter of dough. Let baked crackers cool before breaking apart. Store in a ziplock bag. 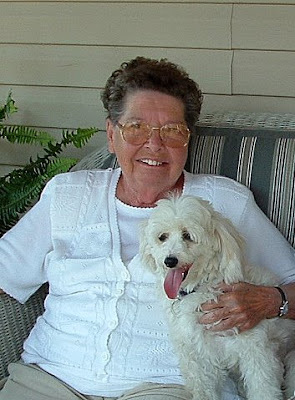 John’s Gram Fran passed away this morning. 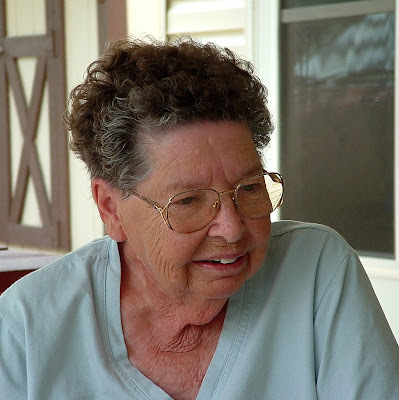 Although our hearts are aching at this great loss in our family, we are reminding ourselves what a blessing it has been to have her share in our lives. Funny, witty and sharp as a tack until the very end, she lived 84 glorious years and for that we are all grateful. I‘ll be taking a few days off from posting. This weekend John and I went Yard Salein’, in other words, we shopped for junk that people no longer wanted anymore so we could stuff our house with their junk that we probably don’t necessarily need. I know not everyone calls them yard sales. That might be a New England term. I have heard people call it a tag sale, or a garage sale, heck in England they call it a car boot sale. Here in RI we call it a yard sale. We haven’t ventured out in years. One reason is you really need to get out nice and early to get the good stuff before it’s all picked over. We do get up really early most weekends, we just aren’t dressed and ready to go out is all. Saturday we were ready. We headed out about 8am, cause those yard salers don’t like early birds. That’s all you see on every sign posted on every pole in town “Yard Sale, 125 Main Street, 8 – 4pm, NO EARLY BIRDS”. So we weren’t early birds. We only found 5 yard sales but I did get 3 great finds. At the first stop I found a really heavy glass pedestal glass cake stand with a domed cover for $2. It looks beautiful on my table filled with goodies. The 2nd find was a Pyrex 9x9 glass-baking dish. I’ve been looking for a 9x9 for like forever. Another $2 bargain. The biggest and absolute best find was at the last yard sale we went to that was just down the road from our house. I saw it as we were walking up the driveway. 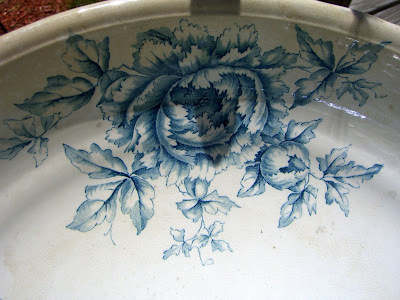 A big, beautiful bowl with gorgeous blue flowers on it. This thing was huge. I flipped it over and it said it was porcelain and made in England. I knew it had to be fairly old. I asked the yard sale proprietor and she told me that it was her friends who lived across the street. She thought it was $15 but if I would wait she would be right back. Seems she had to go across the street to feed her husband. The woman’s trying to sell her junk, get your own lunch old man! Ok that was not nice, but anyhow…….they ended up calling her cause I was getting tired of waiting. 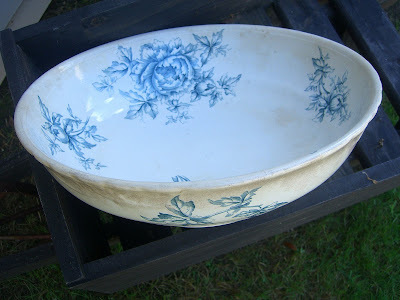 The yard sale lady told her I was interested in the bowl and would I take $10 for it. Yes she said. See it always pays to haggle. I was thrilled, handed her $10, tucked it under my arm and off I went, fulfilled in my yard sales bargains for the day. I was looking for vintage tablecloths, but that never came to be, oh well. Just look at this beautiful bowl. I just love it. I get home and I start to research the markings on the back of the bowl. It took me a good hour and a half before I finally found the information. 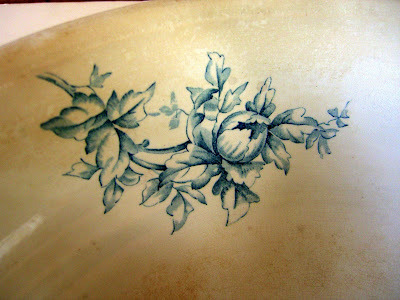 It seems the potter who made my bowl only used this particular marking between the years 1895 – 1901 in Tunstall, England. 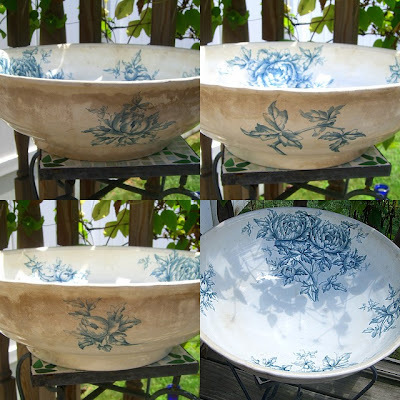 My beautiful bowl was over a hundred years old! A century. How cool is that? I was just thrilled. 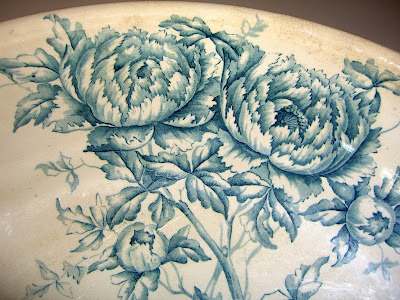 Knowing that over a hundred years ago someone saw that same bowl which now sits in my house and brought it home for her family, or maybe it was a special wedding present, adored by the happy couple for years and years, or it could have been a family heirloom, passed down from generation to generation, the possibilities are endless. 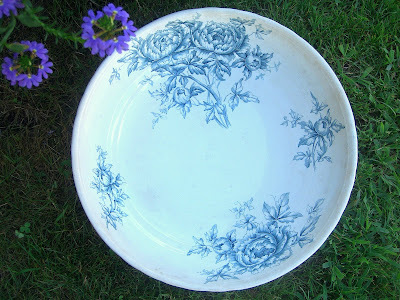 I’d like to think it was used by someone very much like me, who loved to cook for her family, who smiled every time she took it off the shelf to use it, who valued the craftsmanship that went into making it, and was very happy to hold on to it for awhile before it was passed down to someone else to use and enjoy. I have a few “things” in my life that I treasure. My great grandmothers rolling pin, my great grandfathers wooden match holder, my great-great grandfathers scale that hung in his store little store, my grandmothers thick quilt, and now I have this bowl. This beautiful bowl that will be filled with all things delicious and treasured for years to come. No one in my house eats eggplant except me. I planted 4 plants this year and they are producing like crazy. Every few days I need to pick another one. Today John went to a huge all you can eat buffet called the Nordic Lodge. He gorged himself on lobsters, steak, shrimp and everything else you can imagine a buffet designed for men would have. Needless to say he came home hurting. Sorry for him....nope....no sympathy for self induced pain, that is the motto in our house. So while he laid like a beached whale on the couch, pants unzipped, moaning like he just had oral surgery without novocaine, I made myself a delicious grilled eggplant sandwich. I will admit something. I waited for John to come home to eat, cause the way my grill lights up sometimes scares me and makes fear for the life of my eyebrows and eye lashes. It's just safer for him to do it. After I slice the eggplant lengthwise I salt it on both sides over a cookie rack and let it drain for about a half hour. This will take away any bitterness and get some of the water out of the eggplant. Turn it a few times as it drains. 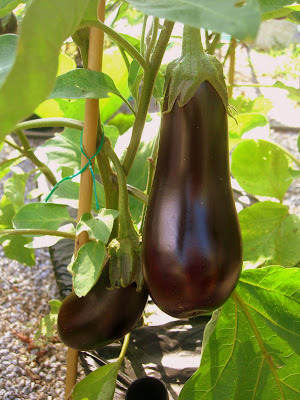 After the eggplant has drained, pat it dry with a paper towel and brush each side with olive oil. Slice a small onion in big slices. I try and leave the root on and kind of fan it out over the grill so it stays together. I also rub some olive oil on the onion. TO THE GRILL! Grill the onions and eggplant turning occasionally. I just kind of keep an eye on them. While they are cooking I butter my bun and get that toasting on the grill. 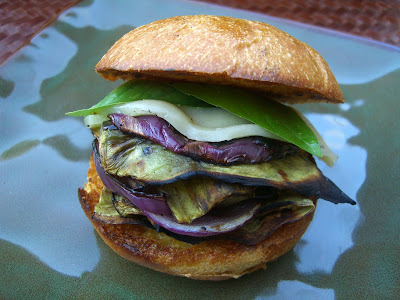 When the eggplant comes off the grill I sprinkle it with a wee bit of parmesan cheese, get it on the bun, layer in the onions and some fresh basil and then top it off with a nice slice of provolone. This is one of my favorite sandwiches and I never have to share it with anyone! This is my version of Pioneer Woman’s Chicken Spaghetti. I took out what we don’t like and added in what we do like to make it my own. We’re not into the pimentos or peppers that were in the original recipe, so I substituted mushrooms, garlic and some fresh herbs. I also thought that the raw onions and peppers that she added would taste too crunchy even after this baked and it looks like I was right. I checked out a bunch of other bloggers comments who made this dish and it was the most common complaint. Cooking the onions and mushroom before hand solved that problem. 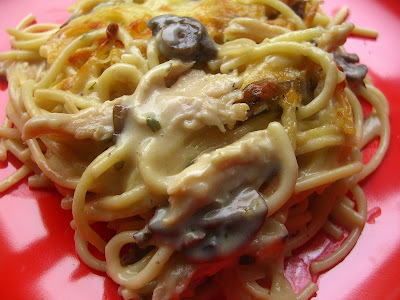 Pioneer Woman's Chicken Spaghetti - my version. I added 1 additional cup of Italian cheese blend, you could use cheddar. Bring a large pot of water to a boil. Rinse the chicken and place in the pot and reduce heat to medium. My chicken took about 35 minutes to cook. Remove from pot and let cool. Do not discard the water that the chicken cooked in. In a sauté pan cook the onions and mushrooms until just tender. Add crushed garlic at the last minute. Remove from heat and set aside. Reserve 2 cups of chicken broth from your pot. Pack the spaghetti pieces into a measuring cup. You want 2 ½ to 3 cups uncooked. I laid mine down so they were flat. Bring the water back to a boil and place the spaghetti in the pot and cook until very al dente. Do not overcook! Are you sick of hearing me say that yet? Mushy spaghetti is just the worst! Drain and let cool slightly. 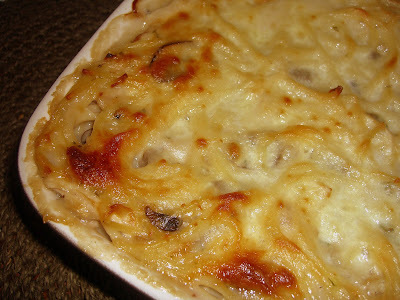 In a very large boil mix together the onions, mushrooms, garlic, chicken, cheese, soup and seasonings. I chopped up a small handful of fresh thyme, parsley and a little bit of basil and added it in. Now take your spaghetti and add that to the bowl then start adding the chicken stock. I added this a little at a time so I could judge how soupy the mixture was. I didn’t want it really soupy; just wet enough to stay moist in the oven. I used about 1 ¾ cup of the broth. 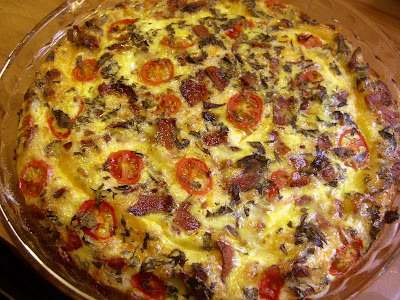 Top with 1 cup of additional cheddar cheese. Bake in 350-degree oven for 45 minutes or until bubbly. 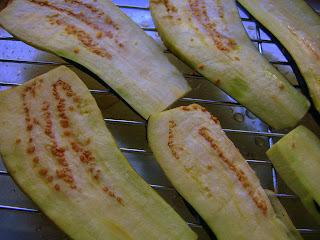 You can cover and freeze this for 6 months, or refrigerate for up to 2 days. This really was tasty and really filling. I can see myself making this many times during the Fall and Winter months. I love that I can make it the night before and just pop it in the oven to heat. Use 1 1/2 cups of cheddar, not 2 cup. I'd still top it with 1 cup of cheese. That made the top nice and crunchy. I'd also add 1 more cup of chicken. I think with those 2 changes this dish will be perfect! Thanks PW.